Last night we went to Dairy Queen and took Addy with us for the ride. We usually get her a little cone. When we got up to the drive thru window, the gal let us know that instead of getting her a cone, they have what they call a 'pup cup'. It is ice cream in a small sundae container with a dog biscuit in the middle of it, for 60 cents! So next time we get Addy a DQ treat, it will be a pup cup. When we came home from DQ we had to drive around the block so we could see the lights on the fence from all sides. 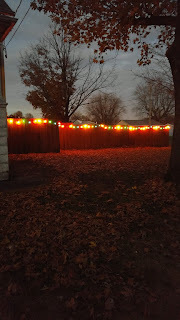 I noticed a couple bulbs were out, so tonight I might go outside right when I get home and replace them.